This will help many travelers on temporary relocation or living in hotel rooms as temporary residents having bare kitchen utilities. Most hotels come with rooms having a small kitchen corner or a microwave . So carrying a few handy mix from home before you travel makes sense as you dont have to go hungry . Same applies to students living in dorms with microwave or in apartments on their own with full kitchen facility but do not have time to do grocery shopping for ingredients. A travel kit with few food packs to start off can be a great boon . 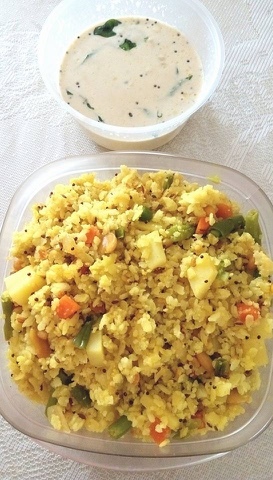 The Poha upma which I posted here is a pre mix made from home. refer my post instant poha no cook recipe . 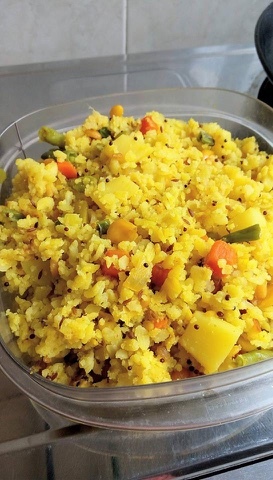 The post below is the same as instant no cook poha as far as ingredients is concerned. The method given below is for a microwave or a normal kitchen use with a pre mix of ingredients. But method of making basic instant poha is the same .The same recipe is followed here . 2 small red dry chillies. 2 tsp fried onion flakes ( optional ). Heat a pan, add oil, crackle the mustard seeds, add the red chillies, cumin seeds, add the cleaned, dry poha ( beaten rice flakes, add turmeric powder and all the ingredients one by one, keep roasting till the poha becomes crisp and well coated with turmeric poswder.Add the curry leaves .The poha should be roasted to very crisp texture. So keep the flame on medium to low adjusting. Let cool , store in a air tight container. Take a pan , add a tsp of oil and add the required quantity of instant poha mix, add some water and cover and cook for 3 minutes till mixture turns soft . If you wish to add vegetables you can do so by chopping them to small pieces, cooking till soft then add the dry poha mix and little more water , cover and cook till 2-3 minutes till done .Make sure to add or sprinkle water carefully or else the mixture will turn mushy. Salt is already added in the poha mix . Instead of adding freshly chopped vegetables, use some of the dry side dish curry you may have as left over . In the above pic I had a mixed veg curry from lunch which I added to the instant poha mix to make a quick filling tiffin. To make instant chutney from chutney mix. Yes you can also make a homemade chutney mix to carry with you while travelling ! 1/4 cup coconut cream powder or coconut milk powder. Pinch of asafoetida powder to be added to prepared chutney mix. Powder the fried gram dal to a fine texture in mixie jar. add the coconut cream powder or cocnut milk powder, add the red chillies , ginger powder , salt . Now powder the ingredients till fine . remove and make sure to keep it in a dry plate,as we need to add the tempering too before packing . Take a pan add some oil, add the split udad dal, let it turn golden , splutter the mustard seeds, add red chillies, let it become crisp., add curry leaves. Make sure curry leaves also become crisp. Remove and when cool add it to the prepared chutney mix powder. 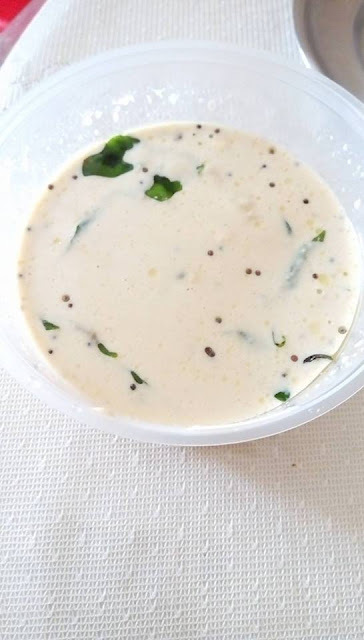 Add salt to the prepared chutney mix and store in an airtight container. Just open the pack, measure out required quantity of powder, add water and stir well till a smooth paste is formed, add more water to dilute till required consistency . As tempering is already added to the chutney mix , you have no further work. Paste directions on the cover or bottle .